"Journaling is almost ALWAYS the LAST thing I do...I am not good at expressing things in words, not good at story telling...I have soo many pages in my son's books that are done all except for the big empty spots where journaling goes. LOL!" The author of this comment - Stephanie - is the lucky recipient of one free copy of Your Words, Your Story: Add Meaningful Journaling To Your Layouts !! Congratulations, Stephanie!! 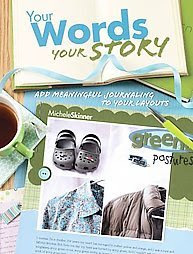 I have no doubt that this book will be of great use to you in getting those pages finished - journaling and all! If you didn't win this time, don't dismay...I have some other great giveaways coming soon. Idea books, of course, but I also have some great product giveaways coming soon including some awesome paper kits from Cosmo Cricket and Making Memories.